One good thing about riding all year round, is well, besides riding all year round, is that when the summer comes, it’s certainly been worth it. If the Spring Classics herald a call to cycle, then the sunshine which hopefully follows, is a call to test oneself and explore new horizons with confidence. Layers of clothing once used for protection against the elements are disposed of; reveal long forgotten muscles that are now ready and twitching. So when mustering the will to give a little more, the answer comes with no excuses. In this case our new horizons, is a dash to Windsor – with a touch more. This week saw the return of the G-Girls and B-Boys. The former heading out to Windsor at pace, and the latter, jumping out of a plane from distant lands, and onto their bikes to steal a brief moment in the sun. The appeal of heading out to Windsor is three fold: firstly, it takes in some lovely countryside; as a flat course it propels you quickly that you can get there in time for some cake; and thirdly, for more cake! However, this time round we needed to make a pause when two riders collided. No vehicles, pedestrians, or animals involved. Just an unfortunate incident where two friends hit the deck. 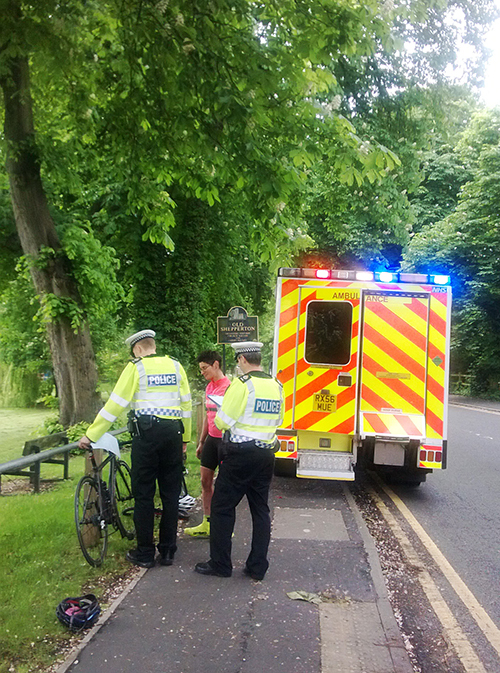 With the ambulance crew taking professional care of the girls, it was time to assess the bike damage: a buckled wheel, a torn jersey, a hole in a gilet. All replaceable. On occasion, the emergency services can also share an interest in your ride. After all we’re human, and this time round it was Kirsten’s super bicycle that got all the attention. Matte black, luxurious and fast. At the hospital, Kaye gets immediate medical attention, whilst we hang out in probably the most tranquil of hospital settings. It’s only a matter of time before x-rays reveal a shoulder fracture and the two are zipped home in a cab; somewhat battered, but thakfully, alive! Rach suggest the right thing to do is to go with the day, and we press onto Windsor. 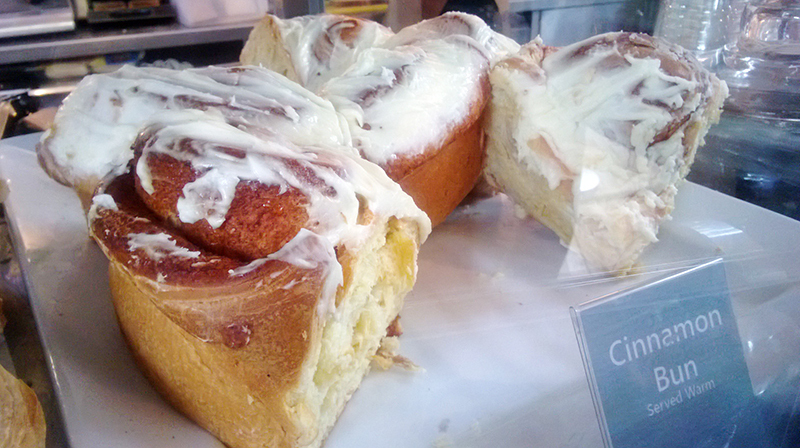 On arrival, we locate the local delight that is the Cinnamon Cafe, and we toast the girls survival with cinnamon buns and tea. By the time we get home Big Chase and DC are revving for a spin around the park. I know they’re going to dish out some PB’s. Not an altogether bad thing, when you consider the motivation that is shared in eqaul measure. By our third Baroudeur-record-breaking lap, I find the B-Boys resting – I simply can’t keep up. 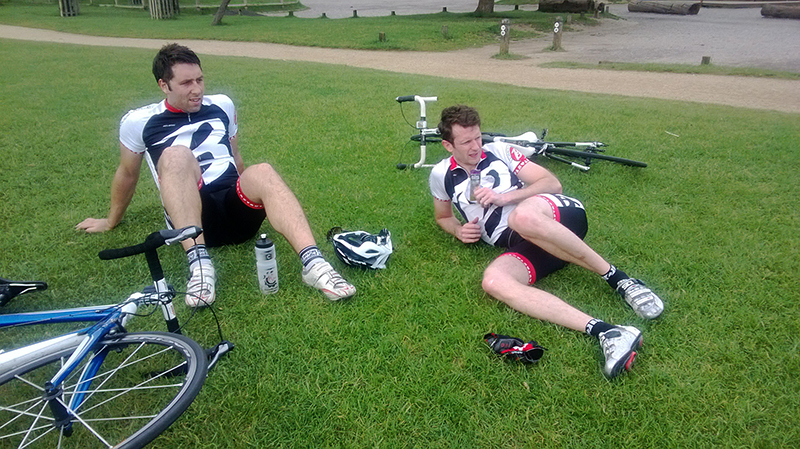 There they are enjoying the sun…or are they simply quizzing someone’s riding style?